John Blair, Trainer of multiple Grand Prix hunter-jumper horses and riders, former Assistant Director of Riding at Skidmore College, and owner of Foxgate Farm, Tiverton, RI: "Everyone should have a QuitKick! Stall kicking is too dangerous to be ignored - it causes injury that can't be seen which then puts the active equine athlete at risk for more serious injury while working. It's not worth the risk." Anecia DelDuco, Second Nature Farms, Oxford, PA: "This is by far the best product I have purchased in a very long time. It does exactly what it is supposed to: it makes your horse quit kicking! I was skeptical at first, time, it seemed a bit too simple to outsmart some of my horses. I have to admit that I watched with great pleasure and amazement as QuitKick 'cured' my very persistent mare of her kicking/pawing after just 2 experiences. Understand that this mare excels in the art of pawing, kicking and generally irratating everyone that passes by her stall! But not anymore! The barn is now a much more pleasant place - thank you QuitKick!" Sara Ballinger, showjumper, Wellington, FL: "QuitKick is wonderful! 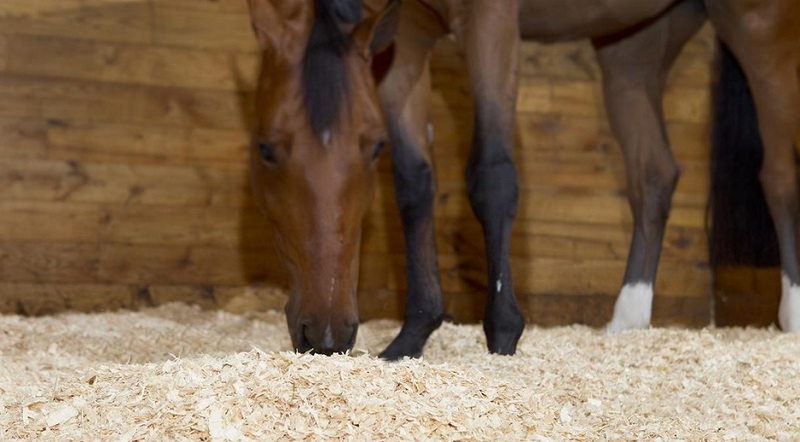 It has totally changed my horse's bad stall manners and it has saved on vet bills to banged up knees and other costly problems." Samantha Walash, three-day eventer, Chester, NY: "Quitkick is a godsend. I am now able to sit outside on my deck in quiet enjoyment. No more stall door banging! I am so grateful. I have tried everything… Quitkick is the only solution. Thank you!" Janice Schick, Morton, IL: " IT WORKED!! My barn owner and myself are quite amazed that after 3 days, my horse figured out it was better to just stand still than demonstrate his emotion by kicking his stall. It’s been about 3 weeks now without a relapse, and we are so happy. I would expect my horse to try it again at some point in the future, but we will be ready for him. Thank you, for making this product available! Jenny Pitman, OBE, trainer of two British Grand National winners and the first female trainer of a Gand National winner: "I am delighted to say QuitKick has been 100% successful and I would have no hesitation in recommending this product, as I am sure it will be of benefit to many other horses and their owners in the future." Liza de Boer-Tillman, livery yard owner, Spain: "I love the QuitKick! It has worked wonders on my stallionQuisquilloso. Within 5 minutes he realized that kicking the door would get him a wet face (which he hates). He still kicks from time to time, but maybe 3 times a week compared to 300 times a day. So his legs should start healing now." Amanda Boyce, horse owner, UK: "It works wonderfully - a God send - Hugo, my horse, has beenkicking for a year. Now he is standing back a little from the door and not even thinking about kicking." Ken Spencer, event rider and livery yard owner, UK: "I have a horse in my yard which used to kick his door to the point where the door would bend. Within hours of installing QuitKick, this behavior has stopped. I was especially pleased because he did not become scared or apprehensive of the door - he just learnt not to kick it. 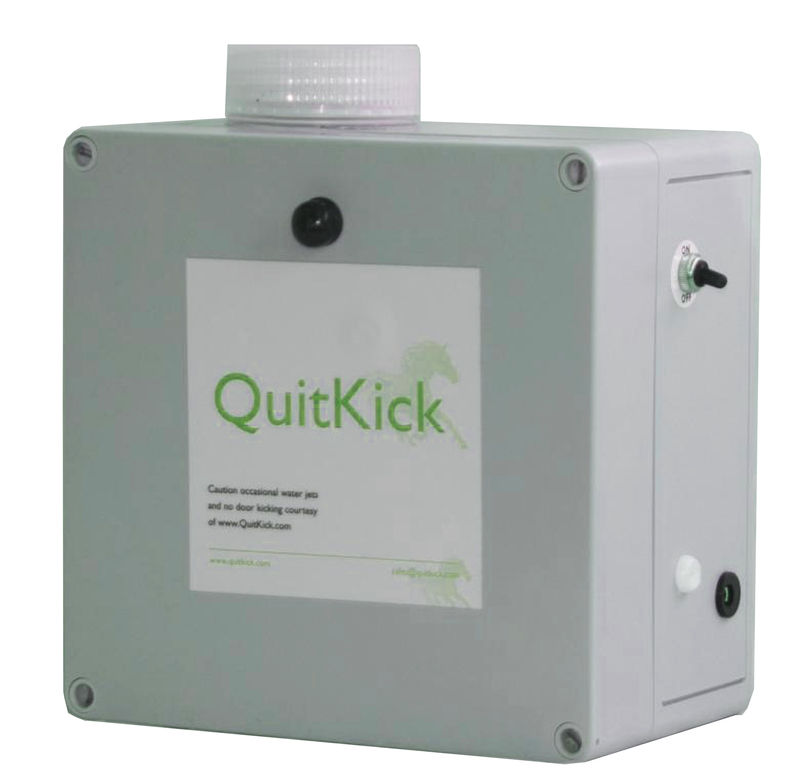 QuitKick worked equally efficiently on other door kickers on the yard. It is a simple and safe way to stop this annoying habit." Sean Roche, stable owner and farrier, UK: "My horse was introduced to QuitKick in an attempt to cure him ofnot only an annoying habit, but also in a last ditch attempt to stop him moving his front shoes while kicking the door. Not only has this stopped but it has also reduced horn damage and bruising to his front feet. The hooves have improved over the last six months, there is now no stress damage or seedy toe. The unit cured him of kicking his door and is now a permanent fixture. As a farrier, QuitKick comes highly recommended." Jennifer Sewell, owner of East Whipley Farm, UK: “An astounding invention. Our yard of 24 horses is now peaceful even at feed time. Door banging is a thing of the past. Buy several sets of fixtures as a machine is not only re-chargeable but also easily moved from one stable door to another." Ann Coombes, livery yard owner, UK: "We had a serious door kicker on our yard particularly at feed times,turnout and when he saw any other horses being given hay. Now that we have installed a QuitKick, not only is it much less annoying but my stables don't look as if they're about to fall down." Sally Bishop, livery yard and riding school owner, UK: "We have had three persistent door kickers on the yard- one of which damaged the stable door quite badly, not to mention the very high annoyance factor! We triedQuitKick on all three horses, all of whom stopped kicking their doors within a very short period of time. I cannot recommend QuitKick highly enough. Every yard should have one."